Shifts within the global economy have generated the manner in which the land is used including the rearrangement of residential neighborhoods or in the case of Shenzhen, the urban villages. Urban villages are pre-existing villages where the city has infiltrated its surrounding by building around them. With aims to reform and improve rural living standards, urban villagers simply wanted to ease into the urban rather than have higher income and social influence. Whole villages are being torn down and replaced by redevelopment housing ranging from mid-rise to high-rise where in many cases migrant villagers cannot afford the new rent. “Class struggle” where the government ignores the demands of the residents has established social hierarchies. Consequently urban development is affected by the class struggle. The speed of redevelopment reflects the desire of “wanting” to take over as a dominant role within the global economy. The market has invaded the way we live and what shapes our cities thus there is an immediate need to build. Speed acts as a conceptual driving tool for the market force. Yet the social construction of cities relies on a balanced ecosystem. There must be different socio-economic statuses in order to run a functioning system. The city as a whole triggers the emotion attached to experiences. The city is constantly changing along with the social engagement. Culture shapes form similarly to the constant morphology of a city; both are ever changing. But one may ask how does one see through the layers over time to gain an authentic essence of the city? As cultural engagement changes including people and the architecture, the urban process becomes evident. 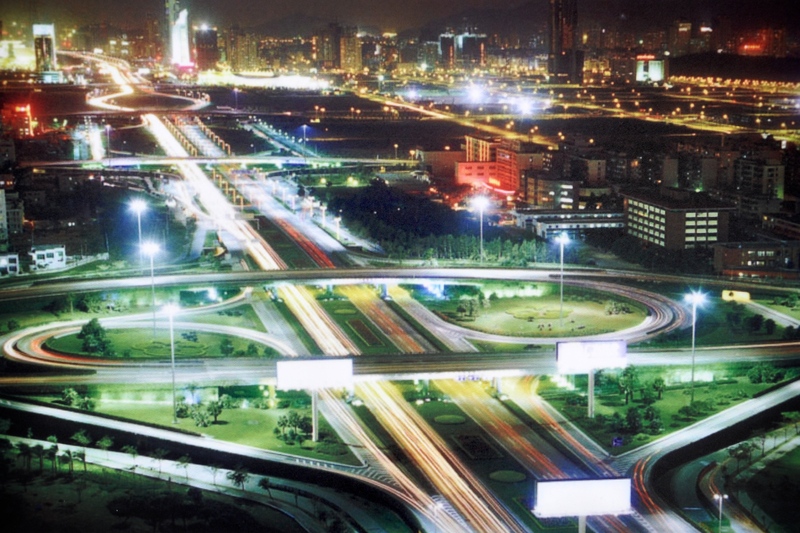 Initially an economic experiment with political intent, Shenzhen proved to redefine the definition of a city. Within thirty years, the population of Shenzhen went from 35,000 residents to 14,000,000, becoming an instant city essentially overnight. The land is fertile due to its close proximity to the Pearl River Delta, which made the area fall under a desirable condition of urban emergence. From rice fields the area was flattened out to provide land for factories and housing. The new metropolis came into existence with no intermediary paving landscape into large highways. The new expansion created transit features and access to capital. Globalization became an ultimate agglomeration. Improving the general standards of living, reforming collectivism and opening Chinese markets, Shenzhen became what it is today, a market driven urbanization that governs and sustains the economy. The question is, should this define or influence the future development of cities? As of now, a city that is inching its way closer to a utopian lifestyle is proving that this may be the route to take. While the procession of luxury brands Gucci, Prada, Chanel and Dior had me dreaming of Beverly Hills’ Rodeo Drive, or New York City’s Fifth Avenue, it was the man who spat on the sidewalk beside me that roused me back to reality in Shenzhen, China. As I soon discovered, this experience constituted my first glimpse of the juxtaposition of the raw with the refined that would come to characterize my foray into the Pearl River Delta (PRD). The contrasting social and economic condition that pervades the PRD is a direct byproduct of the speed at which this region has morphed from farmland into an economic powerhouse. This rapid pace of development is a double-edged sword, however, that fosters the dramatic growth of metropolises like Shenzhen and Guangzhou, bringing jobs, financial resources, and improved infrastructure to these locales while simultaneously posing a dangerous threat to the cultural legacy of the region. Traveling through the Pearl River Delta, it became quickly apparent that the Chinese government’s implementation of Central Business Districts (CBDs) within cities like Shenzhen and Guangzhou has been instrumental in spurring this transformational momentum. The premise of the CBD was to manufacture the appearance of wealth and stability in order to attract more wealth to the region in the form of foreign investments. To achieve this appearance, the Chinese government channeled the necessary funds into constructing and branding a concentrated region in a way that inspired the respect and trust of western investors. As intended, foreign investors responded to this marketing tactic by becoming interested in the region and investing money in it. This influx of foreign capital stimulated growth that in turn generated more wealth in the region. While the designer stores which plaster the streets of Shenzhen portray an aura of wealth and sophistication that the metropolis is marketing, the Chanel boutique here could just as easily be the Chanel store in Paris, New York or Beverly Hills. These high-end chains only reference their own brand and not their position within a specific urban fabric. Beyond the façade of wealth in Shenzhen and Guangzhou lies the painfully sterile reality that the almost overnight accumulation of wealth has blinded the citizens to the many aspects of their culture and history that are valuable and that make them unique. The rush to achieve wealth and development has obscured the value and necessity of balancing progress with preserving and, at times, assimilating the cultural attributes of a society which gives it a unique identity. What is left in the wake of this rapid transformation are periodic reminders of the culture, such as the raw rural mannerisms that are alien to the new face of the mutating metropolis. It was not until I experienced the no man’s land that still exists between Shenzhen and Guangzhou that I began to comprehend the self-sustaining lifestyle that these mutating metropolises continue to encroach upon. 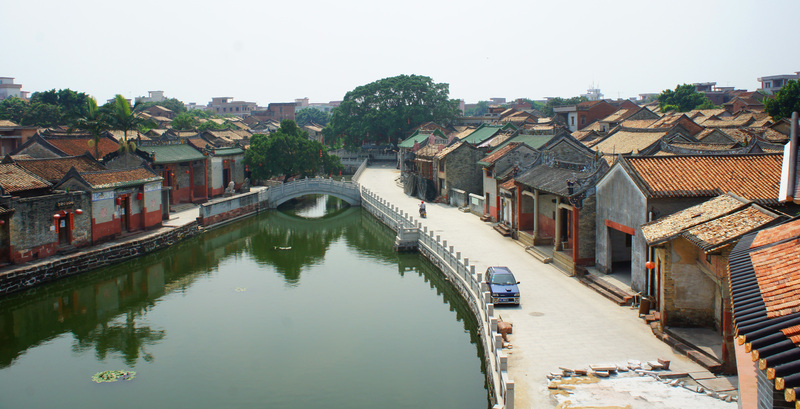 Here, the undisturbed landscape camouflages the World Heritage protected villages of Kaiping. 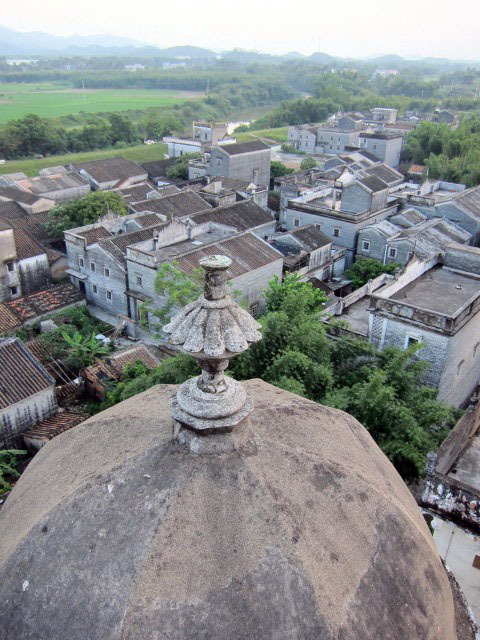 The tops of the towering Diaolou houses are the sole indicator of the intricate, western influenced villages that lie beyond. The Daiolous were built by the villagers as a means of defense against bandits. At the turn of the Twentieth Century, the villages were populated by newly wealthy Chinese who returned from working in Europe and the Americas to build homes for their families inspired by Western Architecture. Walking through these tranquil villages I was captivated by the villagers simple, self-sufficient lifestyle. This way of life has become foreign to those who populate the metropolis, each contributing a single skill within the highly specialized market economy. The crude mannerisms have become the sole unfortunate link between the people’s raw past and refined future. Looking out from atop one of the Daiolou houses the beauty that exists in the simplicity of the village lifestyle made me to question whether the rapid mutation of metropolises in the PRD has caused the urban population to disengage from the value of their former way of life. I suffered my first few near death experiences in a taxicab on the roads of Shenzhen. The white, yellow, solid, and dotted lines seemed like some nice artwork someone had painted on the road. I lost count of the times a car almost turned directly into my passenger door. And as our cab driver swerved in and out of lanes as though weaving a rather elaborate rug, I clenched my hands, bit my lip, and wondered how on earth we were still alive. As I continued to watch in between gasps of breath and my life flashing before my eyes, I began to notice that the traffic was acting like a fluid river. Like a river, the traffic had no breaks or gaps in the stream. As holes would open, cars would come fill the spots. If someone were turning, cars would simply go around. If the traffic began to be congestion, the cars would start doubling up in lanes or start driving on the shoulder much like a river getting blocked up. I derived that the reason the cars didn’t hit each other through all their random bold movements was because all of the drivers on the road were extremely aware of each other. For every action a car had, all the cars around it would have a reaction. The reason there is a heightened sense in all of the drivers is because of the city’s fast growth. The people of Shenzhen have not yet acquired what Simmel in The Metropolis and Modern Life refers to as the quantitative mind of the metropolitan. Their mindsets have not had time yet to evolve from the qualitative emotional village mentality to the calculative metropolitan mentality. The people don’t yet see other people as numbers. In western metropolitans, the traffic is very orderly so that people have to think less about what other people are doing, in order to protect themselves from becoming overwhelmed by their environment, and can focus more on their own every day. However, the people in Shenzhen have a sense of others individuality and are very conscious of other peoples movements and paths. This difference in mentality can also be seen in the simple way people use their vehicle horns. In a western metropolis, people use their car horns when someone cuts them off or does something out of the order of the road causing their conscious to break from the order and recognize someone else’s individuality. In Shenzhen, people use their horns as an informative tool to let other cars, buses, and bikes know of their position in the flow and causing the other vehicles to recognize their individuality. For example, when merging into a highway, a person from Shenzhen might honk letting the bike in the lane over know that they are now next to them. While in Los Angeles, the bike would honk at the merging car for coming in to close to them. Though Shenzhen’s new fast growing economy has shown “dominance it has not truly shown a “inconsiderate hardness” that typically couples economic success. Though Shenzhen still holds its qualitative mindset, the upcoming generations may gain the quantitative metropolitan mindset. In the middle of Shenzhen’s central business district, one can find children riding their tricycles, neighbors enjoying a game of badminton and villagers of all ages socializing in a public plaza. Though busy boulevards and skyscrapers surround the Huang Gang village, this community can still exist as an urban village because the landowners are resisting financial pressure from the government. As a result, rows of generic high-towers become the backdrop for a working class community. Of the new developments just outside the village, four prominent towers now stand on land that was once a portion of Huang Gang village because several villagers took the liberty to sell their land to the government. There is not a trace of 7-story apartments to signify the neighborhood that used to reside there or the public sphere that allowed people to gather. Instead these new buildings are engulfed in the larger mechanism around it. 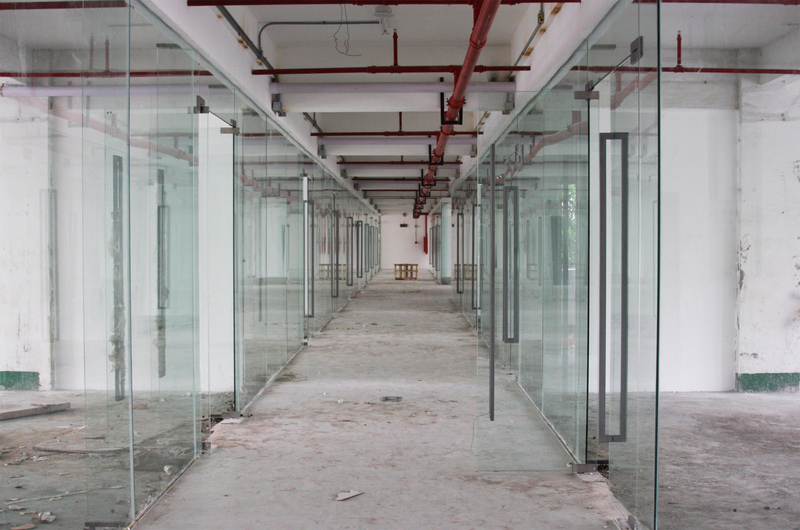 The built environment is a reflection of people’s personal agendas. Their freedom of individuality often times translates to the pursuit of wealth. So whether it is to maintain the urban village in order to receive constant rent payment or to sell land to the government, landowners have the freedom to determine the destiny of their land. In turn, they are also unconsciously constructing the social conditions that people dwell in. Along the dried river front in Xiao Zhou village of Guangzhou, students set up their outdoor painting studios and senior villagers congregate to play cards. These everyday activities are remnants of the peaceful artist community, but traditional vernacular that once encouraged these cultural activities has gradually been reconstructed in succession by landowners who wish to profit from rent collection. Singular decisions to redevelop personal property have amounted to the destruction of old town fabric. Aside from the pursuit of wealth, freedom of individuality can also mean the pursuit of uniqueness and irreplaceability in order for one to distinguish him/herself from one another. 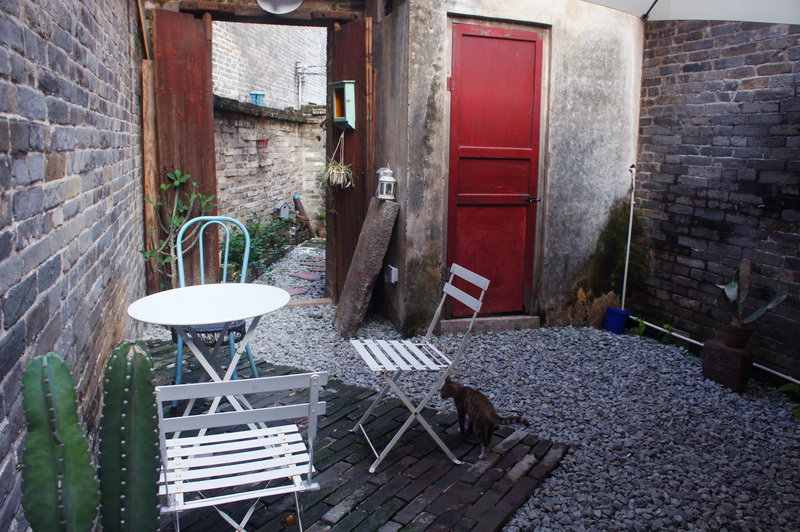 Some artists who were initially attracted to the quiet atmosphere of Xiao Zhou village slowly took flight in search of inspiration elsewhere, while other artists made efforts to sustain original buildings. Tucked away in narrow alleys are shops and cafes that preserved architectural heritage and uniqueness within authenticity. Similarly, villagers of Nan She village in Dongguan protected their cultural inheritance from the Song, Ming and Qing Dynasties. Senior citizens’ emotional and cultural attachment to architectural productions from the past led to preservation of five hundred year old residences and ancestral homes. Though villagers had the liberty to refurbish their homes, almost everyone chose to leave their homes in original conditions or simply moved away from the village, leaving ancient ruins behind. As a collective, their traditions have remained unique and irreplaceable for centuries, so much so that the government placed the village under strict preservation in 2005. Recently, Vice President Biden mentioned in an article in the New York Times that China’s people aspire towards fundamental rights. But these examples of social and architectural constructions within the villages of Huang Gang, Xiao Zhou and Nan She are evident of a kind of liberty that goes beyond fundamental rights. Individuals are able to exercise the freedom to pursue wealth and the freedom to be irreplaceable. It has been said that when Chinese people look forward, they are looking toward money. (Coincidently, the word forward and money have the same pronunciation in Mandarin.) As people in Shenzhen, Guangzhou, and Dongguan transform the destiny of their land, there is always more to be done to keep up with China’s rapid developments. This cycle of building and rebuilding puts pressure on individuals who utilize their freedom to strive for money. Perhaps those who move beyond the sole desire to amass wealth are closer to breaking free from the shackles of freedom. Have you ever loved a city? If so, you could just as equally be repulsed by one as well. For me, Shenzhen, as awesome as it sounded on paper, was a bit disappointing in reality to my overly judgmental western sensibilities. What was described as a sprawling metropolis of vitality, Shenzhen seemed somewhat zombie-like; something looks human, but something is just not right… Bars filled with with not a single person under 35, how the city just empties out after 10PM, or the tenacious gray haze perpetually looms over the city, something doesn’t quite jog. Looking in a confused awe, I realized this is what Simmel wrote about. When I move around a city, I remember peculiarities and moments; querks that make it unique: LA has its beaches and Hollywood, New York has its nightlife and Burroughs, and Munich has Ocktoberfest. I measure the worth of a city not singularly by its economic might, but the experiences I have in it; a cumulative sum of the political, economic, and sociocultural values. But what does Shenzhen have? It has zippy metro rails, one of the LARGEST PORTS in the world, and even where the Pritzker winners do all their fancy architecture. But would a Shenzhener identify their culture as the richest because of their infrastructure or be proud of architecture though not their own? Even a slightly empathetic person like myself could notice that despite all the “fluff” that Shenzhen has on paper, it is blatantly unmemorable. Although there are very smart people trying very smart things like investing in cheap housing and infrastructure – and it shows, don’t get me wrong – what I have noticed is Shenzhen resembles with striking similarities to what Georg Simmel warns in The Metropolis and Mental Life; that the extreme specialization in menial forms of repetitive manufacturing can detach a person from his or her personality, and as a whole, dissolve the bonds people have from their backgrounds and cultures. It is a generic robot of manufacturing; not a place to live or enjoy life – it is true Metropolis. The feeling I get as an outsider coming to a foreign land is that the people of Shenzhen are ill-informed by the western ideals and too readily accept give up their heritage for western culture like McDonalds, brand-names and the pursuit of money so as to mutate Shenzhen into a condition that is more extreme in practice on people less accustomed to wealth. They appear addicted to this lifestyle, and work pointlessly to reach this misdirected finale. By growing so rich so fast, Shenzheners look to the west as their role model for social structure and culture, but these attempts to replicate a culture and context not their own, Shenzheners have perpetuated and exploited this deer call as real. 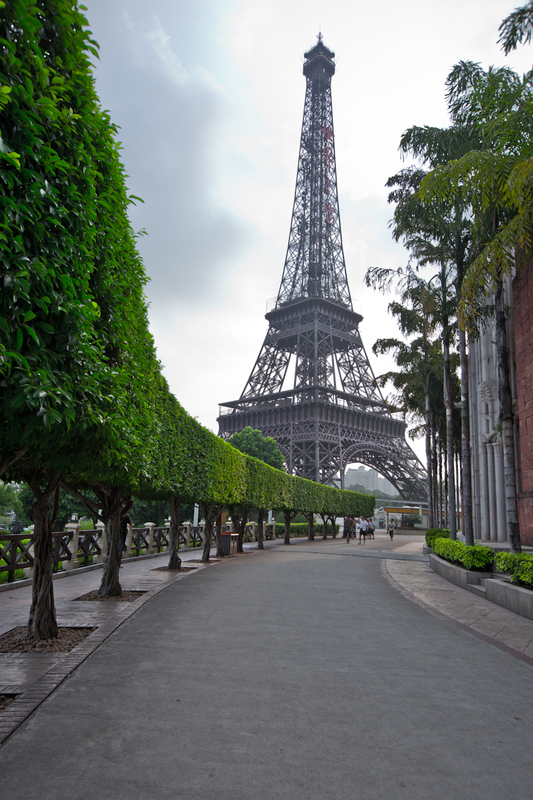 Perhaps the best example of newly “rich” looking for the culture is the Window of the World, a gaudy theme park where the worlds landmarks are at 1/3 scale and almost humorously. Shenzhen is a generic city where instead of ingenuity, Shenzhen prides itself on reproduction of western goods, where instead of thinking outside the box, it prides itself on larger scale of other peoples stuff, and instead of focusing on the vitality and culture of the city, it prides itself on the numbers and statistics as qualitative measures of culture. People here are more captivated by the symbol a brand can attain than the actual quality that it can afford because they are so infatuated by the misguided surge of wealth; lactose intolerant people drink milk, brand names are sold off in the black markets as status symbols, and reproductions of famous oil masterpieces are sold off as works of art. Without a heritage to look back on, Shenzhen latches too quickly to these adopted ideals without truly understanding the context that gives these ideals merit. In growing so fast without a culture, Shenzheners accept this mannequin of real culture to fill in the void, and as a consequence, they sacrifice a cultural sure-footing. But, as we all know, it isn’t the economy that survives through the ages – it jumps and falls, bobs and dips; it is the culture that lasts and evolves, as cities like Paris and London show. But it is not at all the fault of Shenzhen, it was dealt an unfortunate situation, and arguably, the way Shenzhen is balancing living conditions with cultural heritage, it is quite admirable. Luckily, these newly rising middle class have yet to coax out their own culture, and because Shenzhen is still in its realive infancy, one can only hope that Shenzhen does not pride itself on being a culture of replication, desperation and generics just because it is good for business, and truly able to find something to call their own and export it. Buildings go through life cycles, a time period in which the use of the building no longer suites its original purpose. Some developers choose to knock down and start over, but others choose a different approach by reprogramming, and creating a new life out of something that flat lined. Here in China, we have seen a couple of precedents that reexamined the potential for old warehouses, by converting them into trendy creative industries. Through gentrification, old warehouse districts have been converted into lofts, studios, galleries, cafes, shops, event spaces, and coffee houses. By tailoring these projects towards artists, collectors, and the public, these districts start to become thriving communities, allowing artists to live and work amongst their clients and other artists. These vibrant settings bring people from all over to appreciate artwork, and also to support the parasitic programs. Through successful gentrification, these creative industries become their own ecosystems that support art and the community. We had the opportunity to visit a couple creative industries in China, The first one we visited was called OCT in Shenzhen, which was designed by Urbanus. Looking at an old warehouse district they were able to use the shells of the existing buildings, and retrofit them with gallery spaces, creative offices, lofts, and cafes. A steel and glass network of bridges, corridors, and storefronts, parasitically connect and feeds off of the existing fabric. This parasitic network grows through the different warehouses creating a communal public space that connects the multitude of retrofitted loft buildings. This contrast of new and old creates this distinctive texture that allows the two systems to be understood for their individual characteristics, and collectively as a way to create a unique public condition. The project is still under construction, but one could imagine these parasitic connections filled with people actively participating and being a part of the creative industry. 798 district in Beijing, created a creative industry by taking over an old artillery factory that was no longer used for manufacturing. 798’s quaint town atmosphere is created through its different street scales including: a major artery cutting through the district, side streets focusing on a smaller more intimate scale, and pedestrian friendly alleyways full of tiny shops, and art. The streets are lined with galleries marked by intricate entryways that carve into the old fabric, giving a fresh edge and identity to the individual warehouses. As you move from gallery to gallery you pass through a series of vaulted spaces and pristine white walls, contrasting the rough brick and aged wood. This district creates more of an attraction than a community, but the specificity allows the creative industry to be very unique, and engaging to the public. By taking out the sterile atmosphere and high admission fees, 798 creates a completely different setting for art that in my opinion, can become more appealing to a broader range of people. Art museums have their place, but this different setting gives art a new audience and appreciation. The interesting design element behind these creative industries is the importance of program. These buildings were designed with the intentions of manufacturing, and ended up becoming vibrant creative industries. 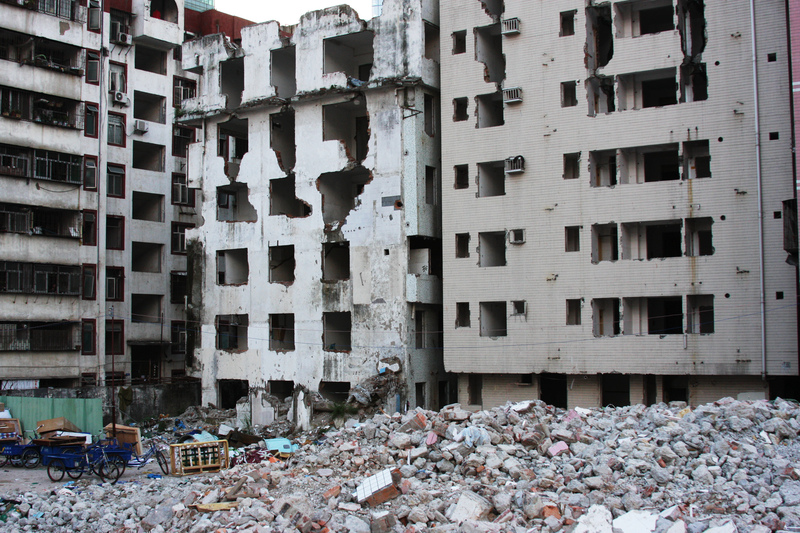 Instead of the buildings being torn down, the shells of the buildings were recycled and given a new life. The importance of program is not necessarily in the form of the space; rather it is in the strategy of program allocation, and finding a concept that creates stimulating environments. The ability to create culturally rich, and vibrant public spaces, out of something that was once intended for private mass production, demonstrates the importance of program strategy. As architects we may not have control of what happens to our projects when we finish the initial design stages, but if we envision interesting concepts, and strategic program strategies, we will hopefully see our ideas successfully carried on. If not the project may be reprogrammed to better fit its users, and sometimes that is just as exciting too. A million little pieces make up the whole, we have the ability to put these pieces together, and the ability to take them apart. Understanding a building by only its materials is to understand a puzzle by its individual pieces. 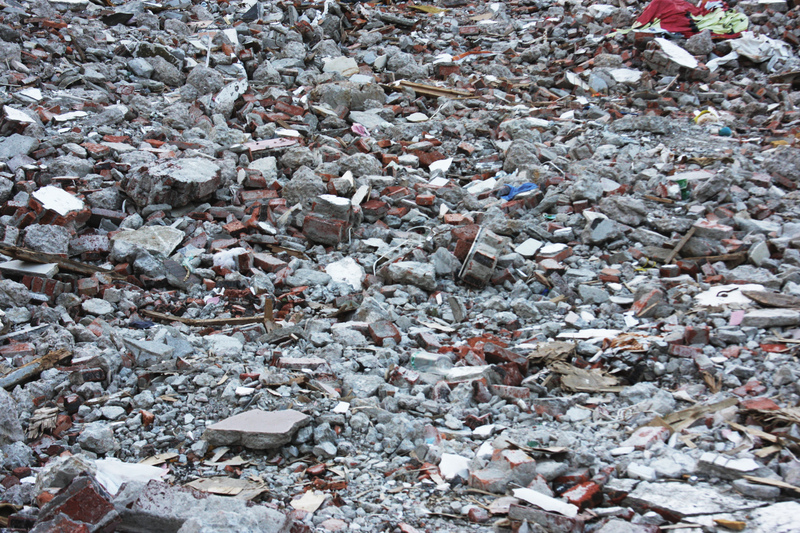 Each brick, each tile, and each shred of fabric, was once part of a larger whole. There is a sick beauty to these images that picks apart not just a home, but hundreds of peoples homes, leaving walls and memories in shambles. The parts that make a whole, are just parts, but sometimes the parts are just as interesting. Sitting amidst Beijing’s afternoon rush-hour congestion, I couldn’t help but be lulled to sleep by the melodic ebb and flow of traffic. It had been two months since I relinquished my automotive lifestyle and Beijing’s daily commutes couldn’t have been more effective at remedying my symptoms of homesickness. Our perception of the city was becoming ever more framed by the windows of our tour bus as it traversed the congested network of concentric ring roads. This was a far cry from the bicycle-laden Beijing of two decades prior, when navigating the city by human power alone was a viable option. Now, as the city wraps up construction of its 6th ring road, which will undoubtedly not be its last, the human experience is increasingly being consumed by automotive gridlock. 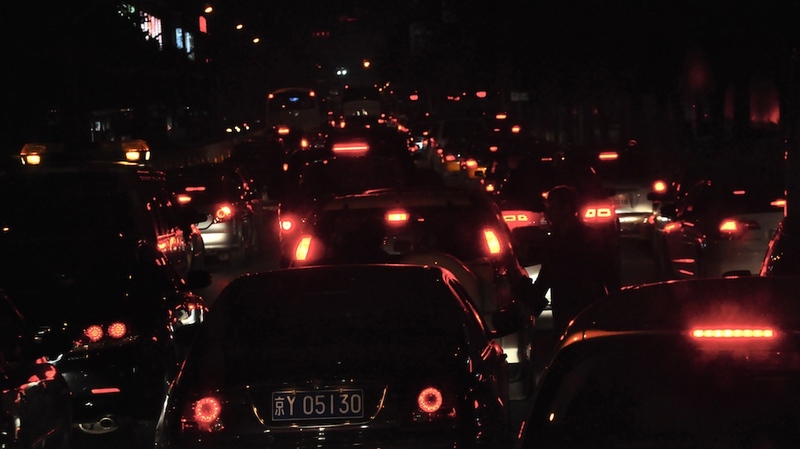 The prevalence of this phenomenon can be attributed to China’s recent jump in rates of car ownership, even surpassing that of the United States. In an attempt to kick-start China’s automotive industry, personal automobiles are being targeted as the preferred form of transport. Many residents are driving their cars as status symbols – bicycles are perceived as third world entities and subways are characteristically proletarian – rather than because the car gets them to their destination more quickly. The Chinese are betting heavily on infrastructure as the foundation for long-term economic growth, but whether that infrastructure entails road networks or regional rapid transit is an important distinction to be made. Looking at two of China’s fastest developing cities, Shenzhen and Shanghai, there is a clear dichotomy in the approach to urban infrastructure. After the fall of the Maoist regime, Deng Xiaoping set up the “Guangdong model” which consisted of removing government interference and handing infrastructural development over to the private sector. If the private sector didn’t deem public transport as an integral part of the city’s future growth it would simply not invest in it. As a result, Shenzhen’s first subway line was not completed until a year ago, since the road network was assumed to be sufficient. After Deng Xiaoping came Jiang Zemin hailing from Shanghai. The “Shanghai model” he proposed was much more government influenced, much more planned and controlled. It was grounded on the provision of a public infrastructure on which industry could thrive. If Shanghai’s projected population growth of 20 million residents by 2020 were to rely on the automobile alone, the streets would be overburdened and mobility would come to an utter standstill. Extensive regional public transit thus became the only logical response for China’s rapid urbanization and the “Shanghai model” has since become the dominant approach to infrastructural development. Commuting via metro around Shanghai over the past few weeks has given me a first hand experience and appreciation for this “Shanghai model”. Just fifteen years after establishing its first metro line, Shanghai now holds the title of having the world’s longest network of rapid transit with a total of 420km of line and 282 stations. 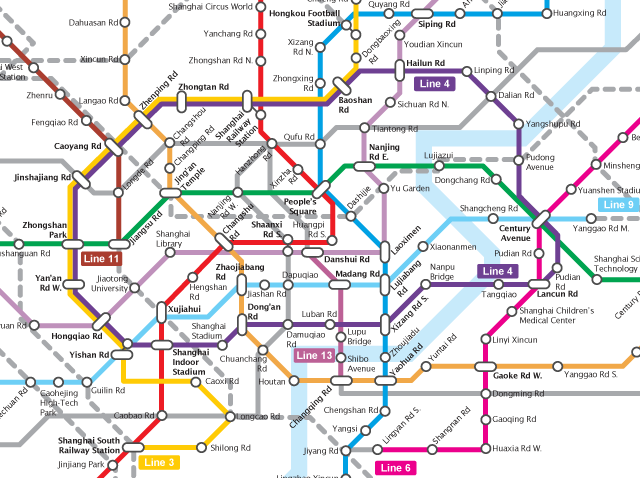 This feat is even more remarkable considering Shanghai has only completed half of its rapid transit expansion plans. By 2020, “this city alone will have more rapid transit mileage than the entire country of Japan.” So although the flow of rural immigrants into municipalities will likely increase over the next decade, cities like Shanghai will be aptly prepared for a sustainable growth in density. Nate Stein in his article Sky’s the Limit in Well Planned City of Shanghai, outlines the significance of having rapid transit systems for the convenience of commuters to reach various nodal destinations across the city; “Besides geographic and political boundaries, a city may have an invisible boundary at the distance that is about 45 minutes from downtown. Beyond this border, people will look for work outside of the downtown area to avoid the long commute.” He goes on to say that Shanghai’s growth potential was greatly expanded when its ‘invisible border’ was pushed further outwards as a result of its extensive subway system. Moving beyond the economic and political ramifications of infrastructural development, there is huge potential for Chinese cities to dictate the quality of the human experience. So much of a city dwellers day-to-day life revolves around getting from one part of the city to another. How people traverse urban fabric, whether it be horizontally or vertically, efficiently or inefficiently, collectively or individually, directly affects their quality of living. In Xiaoshuai Wang’s Beijing Bicycle, the act of cycling through Beijing’s vibrant hutongs gives a romanticized view of the city – whilst my personal experience of the city was more characteristic of the never-ending traffic jam in Jean-Luc Godard’s Week End. While cycling allows the user to move at their own pace and dictate their own path, the automobile restricts one’s movement to the road and puts them at the mercy of existing road conditions. Conversely, there is a sense of scale in Beijing Bicycle, which seems to foster human interactivity. People cross paths spontaneously or ride in groups through a maze of narrow alleys and streets – it certainly leaves the motorist with something to be desired. As our time in Asia winds down, I can’t help but be reminded of my own human experience back home in Los Angeles. In light of the remarkable gains of the “Shanghai model”, Los Angeles doesn’t appear to have an optimistic outlook for it’s economic and infrastructural development. What took Shanghai three years to complete will take Los Angeles a painstakingly long 30 years (2039 being the projected completion date of 3 new metro lines). Until decisive action is taken to prepare for our increasingly urban futures, I can only hope that the extra lane on the I-405 will shorten my daily commute. In preparation for our semester abroad this fall, we were given a packet that outlined the inconveniences of traveling abroad. Most notably, there was a section on culture shock with a humorous description of five different personalities one may exemplify when faced with unfamiliar cultures and environments. Despite sounding quite absurd, I knew from experience the severe impact culture shock could have on the personal psyche and perceptions of identity. Just last summer I returned home after a five-week backpacking trip through Europe to be greeted by a city with an overwhelming sense of cultural deficiency. The homogeneity of cultural attitudes and beliefs that I witnessed in Copenhagen, Munich, and Prague were clearly absent from the cultural eclecticism of Los Angeles. Beyond the spectacles of Hollywood’s entertainment industry, and Disney’s theme parks, where was the underlying sense of a collective identity? What specific cultural manifestation could the majority of Angelinos point to and claim as their own? Without such instances of comparison – afforded only to those who gain global perspective from traveling abroad – a comprehensive understanding of identity of place can rarely be achieved. This fall, as we travel through four Asian countries and engage with a multitude of new environments, the familiar symptoms of culture shock will inevitably return. In conjunction with the AAU program these places will challenge us on an urbanistic level just as they have on a cultural one. Evaluating Los Angeles through the lens of these foreign environments will certainly lead to my increasingly apathetic attitude towards the city’s physicality. LA’s characteristic smog, traffic and urban sprawl have all been accentuated by the cleanliness, efficiency and density observed in metropolises like Tokyo, Seoul and Hong Kong. Similarly, their method of layering infrastructure puts LA’s vision of a utopian automobile driven city to shame. These and many other revelations brought to light over the past few weeks all allude to Asia’s rapid departure from industrial age models of urban development. The one-dimensional nature of western cities can no longer compete with the multi-dimensional efficiency of eastern metropolises. However, my intent here is not to take a cynical approach to LA’s urban strategies or perceived cultural insufficiencies, rather it is to identify the strengths, which will keep it globally relevant. After a weeklong emersion in Shenzhen, China’s experimental economic zone, it was clear that similarities exist between China’s present approach to urban development and those found in Los Angeles. Shenzhen provided the ideal point of reference to which Los Angeles could be re-evaluated urbanistically. For example, streets in both cities are laid out in a grid network of mega blocks – regardless of topographic interferences – thus eliminating any chance for close-knit urban activity to take affect. Similarly, Shenzhen has no established downtown center as planners made the conscious decision to segregate density into discrete business districts, also known as CBD’s. Considering each CBD takes up a sizable amount of urban fabric, all twelve of the districts that comprise Shenzhen essentially qualify as autonomous cities individually. Compare this scenario to Los Angeles and one can easily draw connections to cities like Santa Monica, Culver City, Pasadena, and Burbank – all of which exist at such a large scale that they function independently of one another, diluting any notion of a single metropolitan identity. So why is China negligently going out of its way to import western models of urbanism that have proven to be inefficient in cases like Los Angeles? In Theodor Adorno and Max Horkheimer’s essay entitled The Culture Industry: Enlightenment of Mass Deception, there is reasoning behind China’s pursuit of universally accepted western styles. Adorno and Horkeimer go on to state, “In every work of art, style is a promise. In being absorbed through style into the dominant form of universality, into the current musical, pictorial, or verbal idiom, what is expressed seeks to be reconciled with the idea of the true universal…By claiming to anticipate fulfillment through their aesthetic derivatives, it posits the real forms of the existing order as absolute.” Following this line of reasoning, it can be inferred that Shenzhen exists as a work of art, reflecting many styles in anticipation of suggesting fulfillment. As it develops into a modern metropolis, it aims to embrace numerous “urban idioms”, which represent tried-and-true universal styles. Styles predominantly defined in the 20th century western cities. The mindset of China’s cultural industry is such that the mere perception of one of these stylistic elements, such as the mega-block in Shenzhen’s Futian District, or the suburban single-family communities, automatically implies affluence and authority. Los Angeles thus becomes a branding model for cities like Shenzhen that hope to align themselves with universally accepted existing forms. This year’s 2010 Expo in Shanghai could not have come at a more crucial time, as it focuses on this theme of “nation branding” in an increasingly interconnected world. Pavilions give countries the opportunity to open their doors to various cultural industries and present themselves as a product for global consumption. Those that present themselves in the most appealing wrapper will subsequently receive the most foot traffic. Therefore, by transplanting elements from Los Angeles – a globally branded city – Shenzhen hopes to attain a similar level of global consumption. Even with the numerous shortcomings implicit in Los Angeles’ urban model, it is impossible to ignore the pervasiveness of it’s manufactured image. Hollywood, after all, does a good job of selling itself to the world as a sun-drenched paradise. In this sense, while Los Angeles will undoubtedly fall behind Shenzhen in terms of infrastructure, development, and overall efficiency it will remain the source for ideas. The uniqueness of its cultural eclecticism will keep it globally relevant.